Football's an international business and it's obvious to anybody watching a Premier League game, that players have been transferred in from all over the world. 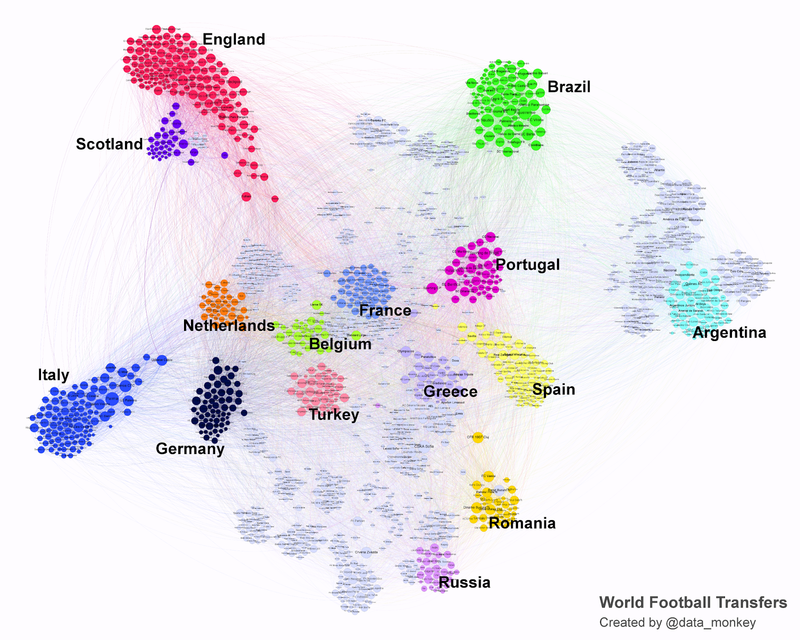 But which countries' clubs are the most interconnected? Is the old cliché true, that British players don't travel as much as their foreign counterparts? 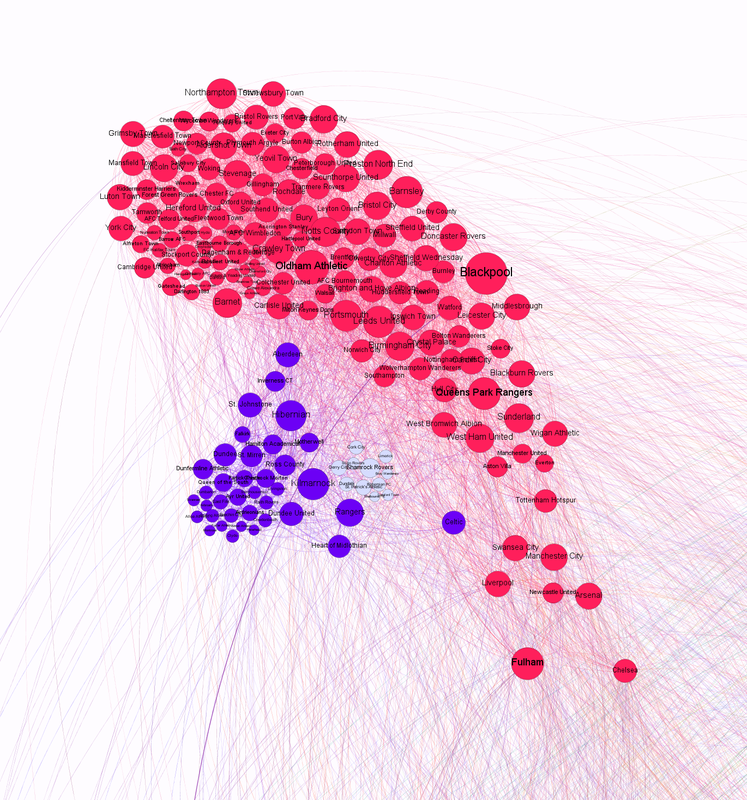 And can we show the relationships between clubs in an interesting way? 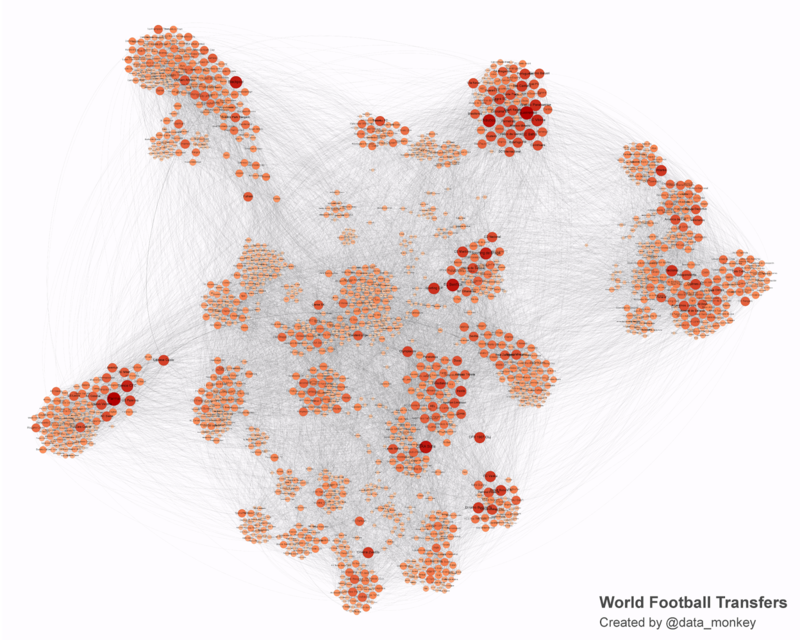 I drew the following images with Gephi, using data on just under 45,000 player transfers, taken from SoccerWiki. Gephi clusters teams by the closeness of their transfer activity; a lot of players moving between teams means that they will group together, while teams that are far apart rarely acquire each other's players. Big version. Zoom in and scroll to see detail. The UK and Italy stand apart from an interconnected Europe. Note the Scottish spur and island of Ireland. Node sizing is by number of transfers in and out. A larger node indicates more transfer activity. SoccerWiki isn't a perfect repository of transfer data, but it's more than good enough to draw this sort of network diagram and overall is a really fantastic resource. Although the way that SoccerWiki stores information makes it impossible to put an exact time-stamp on transfers, data covers a range from 2007 to 2014. I've dropped any team with fewer than 20 player movements - in or out - in order to clean up the diagram. With everything switched on, it renders very slowly and you get a cloud of small, barely attached teams floating around the edges. They're distracting without adding any information to the visualisation. Views were rendered using Gephi's 'Force Atlas 2' algorithm.